The Elections Subcommittee of the House Committee on Privileges and Elections continues to be very hostile territory to those trying to bring Virginia to adopt a transparent, bipartisan redistricting process. Senator Miller’s SB824 and Senator Lewis’ SB1000 were tabled at a 7 a.m. meeting this morning. Both bills were tabled on a voice vote, making it impossible to make delegates accountable for their votes. No fingerprints! The “Tebo Bill,” Delegate Rob Bell’s HB1626, a bill to allow home-schooled students to participate in interscholastic programs, reported on an 8-6 vote. 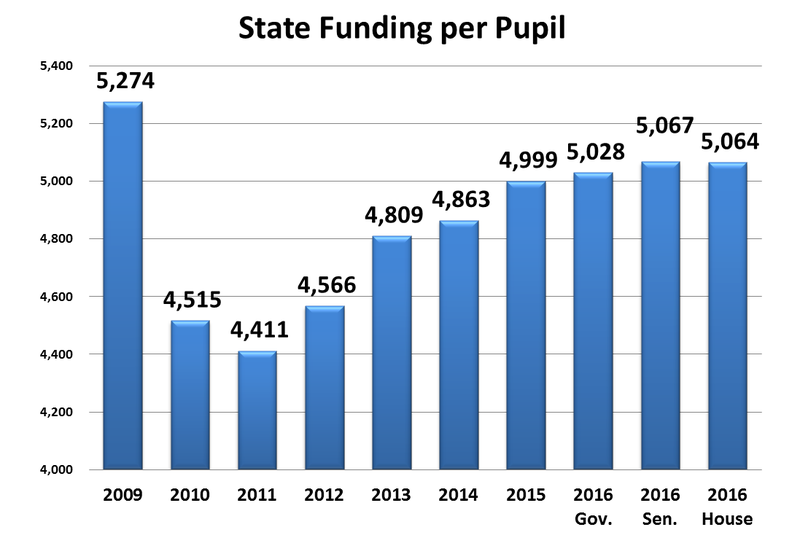 An oddity of the current session is that there is little gap between what is proposed by the House and by the Senate in terms of per-pupil funding. Usually the Senate is higher, sometime substantially, than the House. As you can see from the chart below, the gap this year is $3. All three proposals (Governor, Senate, and House) still fall below where we were in 2009, and this does not factor in inflation. This is one more reason to come to Richmond on April 18th.